This week I had the pleasure of reviewing one of the best low-carb cookbooks, Taking Out The Carbage AKA the Big Book of Bacon written by my friend and fellow blogger DJ Foodie. DJ worked on his book for 2 years and created over 220 fantastic low-carb and primal recipes. 226 low-carb, keto & primal recipes grouped in categories: beverages, breakfast & brunch meals, appetisers & snacks, soups & stews, salads, healthy lunch options, "pasta" meals, main dishes, sides, sauces, spreads and dips, desserts, bakery and even more. Universal measurement system: both metric and imperial units in all recipes. 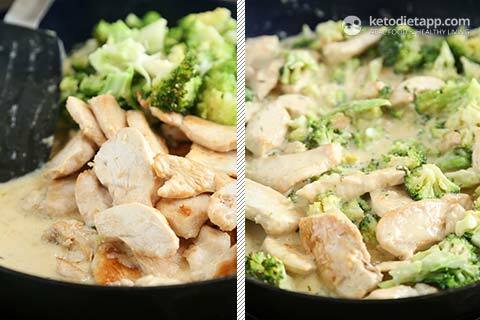 This is a must feature for everyone following a keto diet! Detailed nutrition facts, plus detailed nutrition analysis of each recipe at the end of the book. I find this extremely useful when substituting ingredients as I can see how each of the ingredient contributes to the overall nutrition value per serving. Sample 2-week meal plan that will help you kick-start your diet. Ingredient lists, removable shopping list, guide to low-carb & primal eating, useful kitchen tips and tricks, and even more. All recipes are accompanied by deliciously looking photos and beautiful illustrations. Both printed version (hard cover) and electronic copy are available. Taking Out The Carbage is one of the best cookbooks I own. I think it's a must-have for everyone following a low carb diet. I know what it takes to write a cookbook and I'm not surprised that DJ spent 2 years writing it. 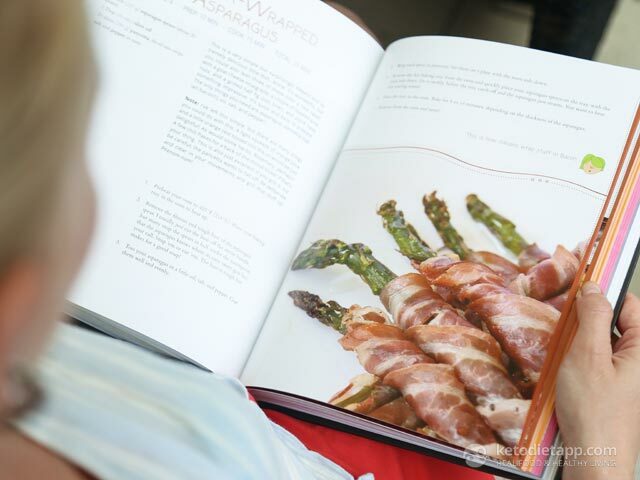 DJ's book is beautifully designed with photos for every recipe and illustrations throughout the book. Visually it's simply stunning. DJ's style of writing is fun and makes following his recipes enjoyable. And it doesn't end there. From detailed nutrition facts, guides, food lists, tips for low-carb sweeteners, to fun facts - this book ticks all the boxes. It's obvious that DJ put an incredible amount of effort in writing this book. Even if you can't get the printed copy in your country, you can download the electronic copy directly from DJ's website in just a few easy steps. 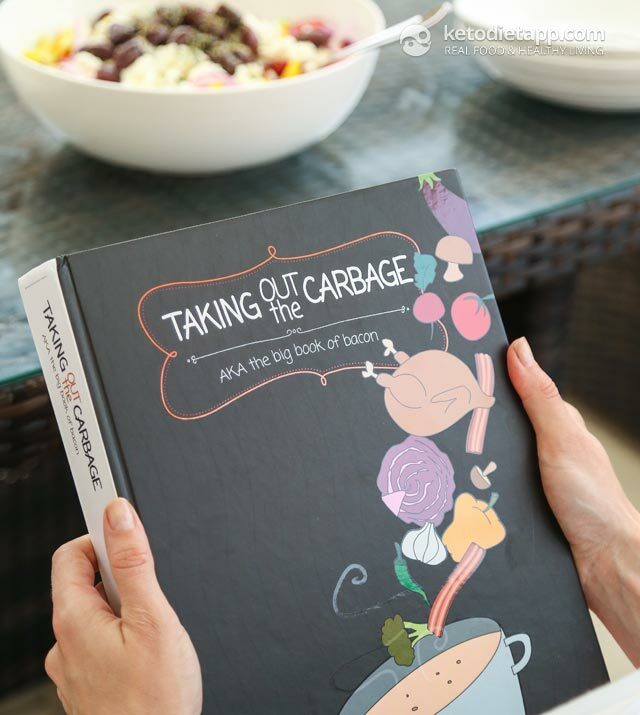 You can buy Taking Out The Carbage AKA the Big Book of Bacon on DJ's website. The pre-sale price is $29.95 USD (ends Monday 15th August)! From breakfast to desserts, DJ has you covered. You'll find all-time favourites such as Sweet Thai Chili Wings, Chinese Spare Ribs, Blackened Chicken Tenders, Meat Lover’s Lasagna, Spicy Burger Casserole and Almond Cashew Chicken. Apart from savoury recipes, you will find some of the best sugar-free treats such as Salted Brown Butter Pecan Pie, Strawberry & Whipped Sour Cream Trifle (with low-carb creme patissiere), Snickerdoodles or Mississippi Mud Pie. There so many recipes I wanted to try from DJ's book that I had a hard time picking just one for my review. 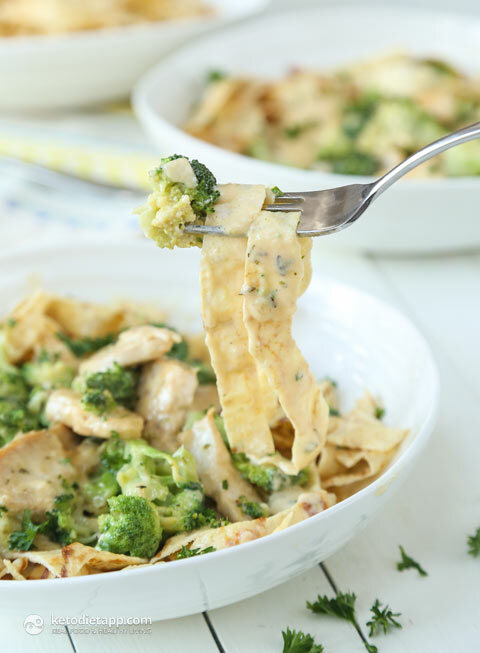 Finally, I decided to use DJ's All-Purpose Ricotta Crepes (page 476) as the main ingredient in my Fettuccine Alfredo with Chicken & Broccoli, a recipe that is based on his Crepe Fettuccine with Tomatoes, Fresh Mozzarella & Pesto (page 224). Result? Creamy, dreamy - I loved it! I think that using crepes is a fantastic way to substitute pasta on a low-carb diet. The crepes are basically pure fat and protein. Don't expect them to taste like "regular" pasta, they don't have the same texture but are a perfect carrier for any sauces and gravies! These crepes are extremely versatile. They’re tougher than your standard soft and svelte French crepe. They can handle a little more thrown at them. They’re also very neutral, from a taste perspective. They’re more a texture or “purpose” than they are a “flavor.” I use them for all kind of things—as a crepe, filled with sugar-free jams, shmears, and berries, but also as a wrap. It’s not at all uncommon for me to put a slice of turkey into one of these things, then cheese, a slice of tomato, some lettuce, and mustard. Roll it up. Deli wrap! I’ve used them in place of tortillas for enchiladas. You can roll them up really tightly and slice them into noodles too! Toss these with some zucchini strips, sauce, and cheese, and it’s very pasta-like... low-primal style! Prepare the crepes. 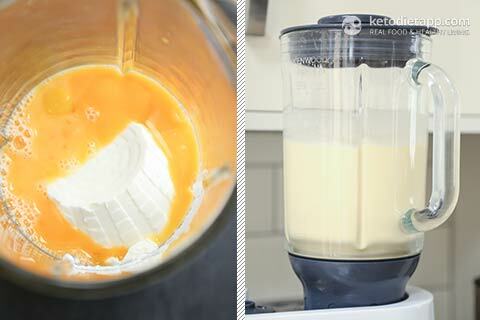 Add the ricotta, eggs, and salt into a blender. Process end until smooth. Set aside. Heat a lightly buttered crepe or nonstick sauté pan over medium-low heat. Depending on the size of the pan, add just short of 1/4 cup (60 mL) of batter to the pan and spread it evenly. 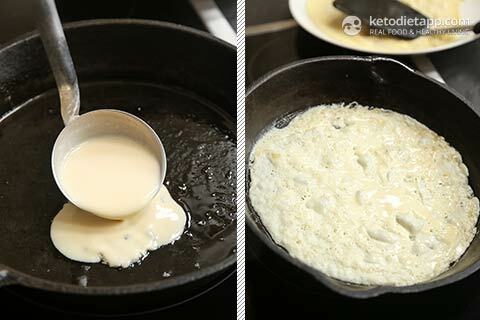 If necessary, pick up the pan and deliberately tilt it in a variety of directions, directing the flow of the batter around the base of the pan until it completely covers the base of the pan, like a very thin pancake. 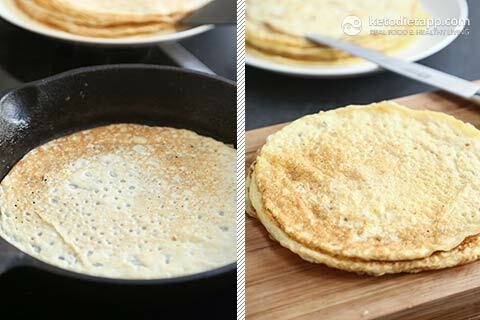 Once the edges start to brown and curl, loosen the crepe with a spatula and flip it to brown the other side. Repeat this process, placing each completed crepe on a paper towel. Stack the crepes into little stacks of 4 or 5; then roll them into fairly tight little logs. Slice each crepe every 1/2 inch (1 cm) for something approximating a fettuccine noodle. You could double that for something like a pappardelle, or go much thinner for a linguini or even an angel hair. Once cut, pick the noodles up and “fluff” them, so that they are a nice little pile of noodles. Set aside. Meanwhile, cook the chicken. Slice it into thin strips and season with salt. Grease a large pan with a tablespoon of ghee and heat over a medium-high heat. 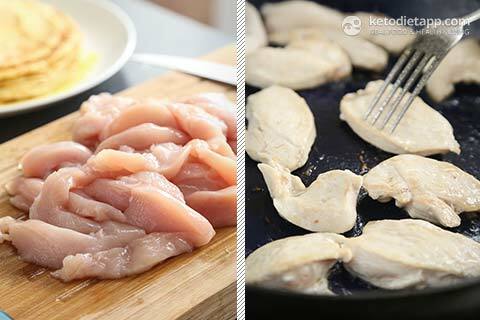 Once hot, add the sliced chicken in a single layer and cook until opaque and lightly browned from all sides. Steam the broccoli or boil in hot salted water briefly for 3-5 minutes, until crisp-tender (I used a microwave and cooked it for 3 minutes). Work in batches if needed - do not overfill the pan. Once cooked, transfer into a bowl and set aside. Place the butter in the pan where you cooked the chicken and add minced garlic. Cook until fragrant and pour in the cream. Add the pepper, salt, Italian herbs and stir until combined. 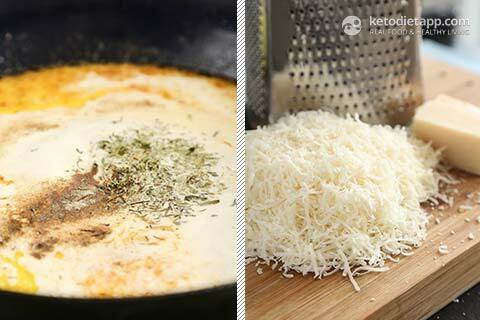 Add grated Parmesan cheese and mix util creamy. Add the steamed broccoli florets, cooked chicken and cook for 30-60 seconds just to heat through. Take off the heat and set aside. Serve with the sliced crepe fettuccine. To store, let it cool down and keep refrigerated for up to 3 days (meat with broccoli separately from the crepe fettuccine). What can be substituted for the ricotta, my husband is lactose intolerant and that is one of his worst. Oh My! I cannot wait to try this! Fettucinni Alfredo is one of my absolute favorite dishes, whether it is by itself, or with chicken or shrimp. Thank you for giving me a way to have my pasta without the carbs! DJ's recipes are amazing. I follow him on Face Book and have enjoyed every recipe I've made by him. I don't miss anything, i love eating keto!I don't even miss pasta , and I'm Italian! I must say, if coffee was excluded, I would be in trouble! I miss pasta and cereal since doing low carb. I so love the crispy sweetness of cereal and the soft, creamy goodness of pasta. I've been eating Keto/LCHF, not especially successfully, for 8months. I think there is enormous variety in the types of food permissible but personally struggle with the fact that if I want a quick 'treat' to say, have with a coffee on the weekend, I have to start from scratch and make it. Kind of elongates the time required to have a coffee! Probably also a good thing: means I usually don't bother. I am a big fan of Keto mug cakes as an occasional sweet indulgence and think one of these topped with a bob of whipped cream is amazing. They are incredibly quick and easy to make which is a huge bonus. Since starting the Keto challenge I have eaten foods I never would of thought about eating and getting healthy in the same sentence. I have the main Keto cookbooks and love them, even got my partner into eating foods he also was told not to eat by people who think they know about what's good and bad. Keto has educated me and my partner into a healthy lifestyle and taking steps to avoid the middle age downfalls  keep it up Keto we love you . I've finally reached the point in my new Keto life where I don't miss any particular food! YAY  Because of all the amazing recipes that you all have created,I've been introduced to my kitchen,thank you, and I'm stomach pain free! However, I do miss being able to go into a restaurant and not have to analyze the menu. Looks great. Will definitely try this recipe! Such a thorough review! Thank you! I will admit I miss macaroni and cheese. We tried it with cauliflower one night and it just wasn't the same! I've also noticed I get a HUGE sweet tooth that I never used to have before starting keto. I miss pasta so much. I used to eat noodles at least 4 times a week, and zucchini noodles just aint the same  But this receipe looks amazing, can't wait to try it! mmm I don't really miss anything in particular actually. Wish I was more disciplined because this really is a better way to eat. If it HAD to me something -- maybe rice because its absorbs a lot of gravy/sauce and nothing else does that. I love your site it is really informative can't wait to see your cook book having it all worked out for you can make it so much easier. 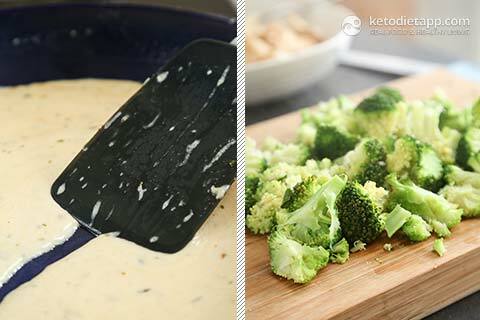 Having started out on a Paleo diet journey a few years ago and now moving on to the keto side of the fence, I have to say that the recipes available are absolutely fantastic. So glad to now be on board. I really miss pasta, it's essential for a quick and easy dinner, at least it used to be. And I hate Miracle Noodles, just not the same! This looks yummy! such wonderful recipes! I'm definitely going to try this one! What I miss most since I've been eating low carb? Sangria! Since I started eating low-carb I miss the most my baking, bought a breadmaker two months before starting on lchf and I'd love to use it again! Miss bread and focaccia. Sugar kind of went away naturally and I don't mind too much...the carbs are still work in progress but lovin' the way I feel and that keeps me going  Plus this blog is awesome and I am really thankful for all the resources I can find here! I miss Crunchy Things! Like granola and hard bread. I don't miss upset the stomach and being desperately hungry several times per day. I miss eating fruit and crunchy foods or snacks. I would love to have that book and I will try the Chicken Alfredo. Looks so good! I would say for me the two things I miss the most is plain old peanut butter and toast and mashed potatoes and gravy . I miss chocolate and ice cream! But my sweets cravings are subsiding slowly! Excellent! I need some new scrumptious recipes in my life right now. Keto can get very repetitive at times. I most definitely miss pasta...will be trying this recipe very soon.. The zoodle thing is ok, but i think using the crepes may give me the te ture im so missing. Thanks for sharing this recipe.. Would love to win this book. I do miss treats and quick snacks as I can't always think of what to have when in a hurry. I just purchased and got the ebook by mistake! Already my favorite book, but I want the hold-in-my-hands book!! Hi Debi, I think that if you contact DJ, he will be happy to help you get a printed copy! I love new ideas for feeding my family! Look forward to this new book. I don't miss any specific foods because I actually prefer keto prepared food over anything I used to eat. What I DO miss is the convenience of being able to easily find something to eat while away from home either travelling or at a 2+ day event. If it's just one day, it's easy enough to pack up food to eat but longer than that and food becomes a real challenge - frozen, pre-made meals only last a day on the road and you can only eat so many nuts & seeds! I'm always looking for travel-friendly foods, particularly with high fat content, as that seems to be the most difficult and I often must resort to tea with coconut oil and ghee but I miss actually eating. The thing that I miss most is pizza. Great job D.J., have followed you for a long time and LOVE your recipes! Congratulations!! I miss something crunchy... This sounds like a great cookbook! It's been a long time since I was able to eat bread, but I still miss it. The things I miss most are warm chocolate chip cookies with a glass of milk. I miss the use of bread and pastry layers to wrap other food in. Like grilled cheese or bagels and cream cheese. I miss eating pulses, lentils, split pea soup. I miss homemade bread the most since I started eating low-carb. There's something about the texture and flavor that I haven't been able to replicate. This looks like a fabulous book with new and creative food ideas to lower the carbs and eat fresh and clean. Thanks for the recipe for fettuccine as I absolutely adore Alfredo and Noodles...definitely going to try this one out. Pizza....its my trigger food but I love pizza and miss it dearly. LCHF stuff just doesn't quite fill that craving! I miss crusty bread but I feel much healthier on low carb diet. I do have some problems with raised cholesterol though so trying to tweak. Oh, this looks like a WONDERFUL resource! And I'm loving this recipe for faux noodles. Thank you! I miss Chocolate Babka. Nothing I've tried compares to the real thing. I need this book, looks like a great one! I definately miss pasta. Any kind! I love this recipe. I am getting the ingredients today to try it. I wonder if the crepes could be used for wraps too! I don't really miss anything since going low carb. I'm eating all my favorite foods that I couldn't eat on other diets. I miss grilled cheese sandwiches. Looking to make this for dinner next week. Thanks for the review! I probably miss oatmeal the most. I love lo-carb! We've been trying out a keto diet for about 3 months, and after healing a bit, we are both starting to lose weight. I've lost 11 pounds, and my husband has lost a bit more. He has kidney disease and is diabetic, so this lifestyle is perfect for him! This book looks like a lot of fun and also very informative. I'd love to win it and use it! This book looks like a welcome change for me! I get stuck in a rut when it comes to low carb/ketogenic recipes. Looks like lots of great new options! I miss REAL bread. Soft or crusty, warm from the oven. Bread. I appreciate the time and amount of work that goes into creating these healthy recipes. While I have never been good at that I appreciate those who are and then are kind enough to share it with others. I would love this book to help in my journey of wellness. Since starting Keto, I miss fluffy bread and mashed potatoes. But at least yummy recipes like the ones in this cookbooks help ease some of that! Another cookbook is always a great addition! Especially one on Keto!! Thank you for this giveaway!! Bread is the hardest food to avoid for me as I find just about anything you order out has bread in it. Its a shame there are not more cafe's that are Keto/Paleo friendly. I love zucchini pasta, but very much looking forward to testing out this recipe. I miss chips and crackers the most, salty snacks. I mostly miss my pasta...would love the book. I miss tacos and pizza! But, Im working through it!!!  This book looks fantastic! I would love to own it! This recipe looks delicous. What I miss most since I started eating low-carb is drinking chocolate milk! I always miss pizza and pastries! Will have to get my hands on this cookbook! Great giveaway! the cookbook looks amazing, I love the title of it! I really do miss my pasta, so I'm very eager to try this! Fingers x it doesn't disappoint! But I feel so much better without carbs that I'll learn to live without it. Feeling excited to get started with all these recipes. I have to say that i miss pasta the most on a keto diet. Looking at the recipe above I think I finally found a replacement that is filling enough. I make a lot of Zoodles, but it just doesn't have the right texture. Also sometimes the convenience of not having to prep or cook everything yourself.. Thanks for the good tips and recipes! What do I miss most since starting low carb? Being able to buy cereals for breakfast. I adore the various low carb granolas and especially Martina's allergy-free keto cereal squares, but it really is a pain having to make them. I love cooking, but I just don't have the time!!! I just started looking at DJFoodie today and I am very excited about the book. I did Atkins a few years back and lost 45 lbs. but some of it seems to be creeping back. I am anxious to get back to eating strict LCHF again and this book looks like it might give me the boost I need. Thank you! Love eating low carb. Chicken alfredo looks amazing. Cant wait to try it! Imagine, a pasta substitute. The things I miss the most on a low-carb diet are: El Monterey Chicken & Monterey Jack Chimichangas, Breads, and desserts, as pies and sweet breads. I miss the EASE. A lot of people use the saying, "Fail to plan is a Plan to fail." I totally feed that! I can go longer without food but not knowing where I can eat, or IF there is good food, it a major stressor. So I plan it all! This sounds awesome!! Thank you for giving us another pasta option!! I can't wait to try this!! I miss potatoes the most!! Especially french fries. I was never much of a pasta girl, but this looks great! I miss birthday and wedding cake. I make low carb cakes for my family, but I miss being able to join in the food aspect of other people's celebrations. I'd rather stick to keto and get its benefits, though, than eat the cake. I still miss bread the most. I loved all kinds, but especially corn bread or muffins (double whammie on that one!) Potatoes were relatively easy to let go. OMG, so looking forward to trying the 'noodles' with my homemade cilantro pesto! What a great idea to make them from crepes. Going to try this out soon. Ohmigosh, I miss just about everything some days, but I cannot tell you how much I have missed pasta. I've tried zucchini noodles, and they're great but just not the same. And those weird non-food Shirataki noodles? I just can't put anything on them to make them palatable. I miss my homemade bread but it's worth giving it up for better health! Yay! An alternative to those gluten-laden noodles! Can't wait to try this yummy recipe! 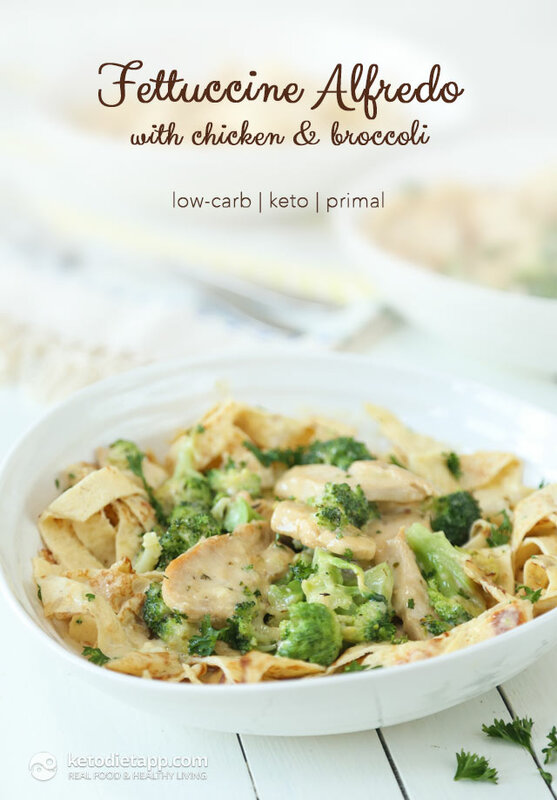 I really miss pasta,nachos and french fries but I Can't wait to try this fettuccine recipe! I miss bread the most since eating low carb. Since I started eating low-carb, I miss bread the most  But this looks great! Crepes made from cheese with cheese sauce; my life is complete! I miss pasta, bread and potatoes the most. What I miss most about eating and cooking this way is absolutely nothing. I am less hungry and all the recipes I find a delicious and nutritious. All in all it is a good way to go to be healthy! I miss bread, the sour doughs, the crunchy crusts of freshly baked loaves and of course toast for breakfast. Brilliant idea using crepes as fettuccine! I miss pasta. Will definitely be giving this a go. If your other recipes are as ingenious as that your book will be a great asset. BREAD! Eating low carb makes me miss homemade bread. I miss tuppa toscana from Olive Garden, which is my favorite comfort food. I wonder how this recipe would turn out if it were adapted ketogenic? I LOVE the Keto diet, but I do miss all my fresh veggies. I am sooo excited to get a peek into this book! I think I will carry it around everywhere with me  Love that it is written by a chef! I have been low-carbing for almost 2 years and I miss popcorn the most. I miss cake and cookies, and not being able to walk into anywhere and order lunch or dinner. Great recipe!! Would love a copy of the book. I miss bread and pasta the most. Thank you for the KetoDiet Video Channel and website/blogs. I occasionally miss M&M's when my sweet tooth kicks in. Look forward to trying more Keto style recipes! I miss Italian and fried food. Sigh. I miss the convenience of bread as a carrier for other food, so sandwiches, toast. I'd love to win the book, I love real books. I am really looking forward to this new book! This looks great. Since I have been following a keto diet for about 3 months, I could really use some recipes to mix it up. These look great. Thanks for the offer. Crossing my fingers. Unfortunately the site will not let me leave a comment for the giveaway. I miss rice, especially whole grain Basmati rice and Red whole grain Carmargue rice. Cauliflower rice is ok, but t just doesn't have the texture or the flavour. The book looks yummy! Would love to win a copy. I love the crepes. I'm still learning how to do the Keto diet, it's a slow process. I would like to win this cookbook! The thing I miss most is pastries! I miss ice cream the most. I recently started following a Keto/Paleo/Low Carb diet and have never felt better, even after a couple weeks. I'd love to expand my limited menu selection and also prefer to have physical books than websites or print outs. I know I would get a lot of use out of this and would enjoy cooking from it for friends and family, as well as for myself. I do really miss sourdough and pretzel bread and macaroni & cheese the most. What I really miss is sandwiches, or just to be able to really quick grab something on the go, it has all become way harder, oh and potatoes! I thought I would miss fruit and other carby things, but since going ketp has helped daily bloating and inflammation from an autoimmune disease, I honestly don't miss anything! I am making tvcxhis for dinner tonight. Thank you for posting. The one thing I think I miss most is nothing. I have been able to find a work around for everything I thought I was missing out on. Yes it can be a little more time consuming but, I have to say all my cravings have been satisfied through Keto. Look great, I want to try the crepes for tortilla shells! Can't wait to see th cookbook. Don't miss to much any more. Though I do hate to go by the bakery when they are making fresh bread. Would love to win this book, it looks fabulous. I miss toasted white bread............so easy, and convenient. After a cheats day for my anniversary I've come to the conclusion I'm not missing much ........definitely don't miss feeling bloated and lethargic! Didn't realise how 'rubbish' normal foods can make you feel. Loving Keto.......just need to be a bit better organised and introduce more variety as I feel as if I'm eating the same stuff all the time! I've been a fan of DJ Foodie's blog since before he began writing this amazing cookbook. Love his recipes and writing style! I'm just starting my journey into low carb and this looks like a great site to get good information and recipes. I think I miss the freedom to eat whatever I want but I know that leads to problems and why I'm making the switch. To be more disciplined and a better awareness of my nutriton - which makes for a better long term shift back to freedom. Just wanted to say I've been doing really well with the 90 day challenge, but I found this post really challenging. Reading the comments has really thrown me and now I have awful cravings and can't stop thinking about all the things I can't have. Maybe it's a bit of a triggering question? looks like a great book, getting back into the low carb lifestyle, will give me a great jumpstart! I just read through the Fettucinni Alfredo recipe above. What a cool recipe. I am going to make it this weekend. I would love to be able to cook more recipes from this book. Perhaps I will win it! Thanks for the giveaway! I do NOT miss anything about not eating carbs. I haven't lost any weight yet, but I just finally caught on that I could NOT drink white wine every night and lose weight even though I am eating lots more fat and no carbs. So as of this week, I am alcohol and wine free so hopefully now I will start dropping some pounds. I only have 20 to lose but it is harder then it sounds by the way I've been trying before the Keto Diet. Thank you for all of the information you provide for us newbies! Sounds heavenly, and I will definitely try the recipe just as it's written. However, I was wondering if this would work with zoodles, or would make the dish too watery? (I recently made a baked ziti dish for company and made the same for myself but substituted the zoodles for the ziti, and it was delicious; but I did have to pour off some of the excess liquid from the zucchini. I miss potatoes and cookies. I would looooove a copy of the book. Always looking for info about the LC diet and more/new recipes. I am experiencing a little stalling on weight loss after loosing 3 kg but determined to continue. DEFINITELY pasta. That was easy! I miss the most phyllo (filo) dough and Raffaello! I most miss baked goods, like cookies & cakes. Some days I make keto mug cakes just to try & get over the cravings. I have actually been able to add foods back in since healing my gut so I'm not missing anything right now . I miss being able to eat the homemade pancakes I make for my 4 year old daughter. She loves them and always wants to try to share with me. Thank you for a recommend share. I just ordered your books and a couple more to get us more foundational with Keto. WOW - would love some new recipes. The fettuccine looks great! Can't wait to try it. Beans and fruit. I know that is nothing splashy, but those are the 2 things I can't make low carb! Pizza, burgers, ice cream, can all be made the keto way so I don't really miss them. I used to eat at least a serving a day of all different kinds of beans and at least 2-4 servings a fruit a day. Love plums, pineapple, peaches, bananas...etc! mmmm Your alfredo looks yummy! Will def have to try the "crepes". What I miss most about going low carb is the occasional entire bottle of wine. I am a mother of two and I also work full time. What I miss most is my grandmother's arroz con gandules. I miss having a soda every once in awhile. The carb count is staggering though. Love alfredo can't wait to try it!!!! I miss New Mexican food - sopapillas, enchiladas, pinto beans, tamales, chile rellenos, Indian frybread tacos... some can be made "low carb" but they're just not the same. I miss gravy: brown gravy on mashed potatoes; white gravy on biscuits & chicken fried chicken. The only carb I miss is fruit as we have an organic farm. Since going low carb I miss corn chips the most! I just love chips and salsa! What do I miss most? Gosh, I have found a substitute for most everything! I guess what I miss is spending less money to buy ingredients for foods I like to make! I miss fruit and berries- apples and kiwis especially. After that, pretzels and chips. I miss bread and pasta. But these crepes will help. I miss crackers and doughnuts the most! At first I missed a buttery dripping thin sliced extra crispy toast triangle to dip in over-easy warm egg yolks but now I use bacon with no regrets and lot of satisfaction. A little creativeness and all you lovely ingenious Keto cooks' (recipes) have kept my stomach and head very happy as I venture forward into the Keto lifestyle. I am trying to manage my Type 2 diabetes through diet and lifestyle. Thank you for all of the helpful information and amazing recipes you share. Also, I miss Fish n Chips! The thing I miss the most after going on a keto diet is going to a good Italian Resturant and having a plate of pasta with a bun and a nice glass of red wine !! Since I've started eating low-carb, I feel much better and I don't think I'm missing something... Maybe just bigger amounts of fruits, nuts and yoghurt  And sometimes honey. I miss anything starchy; pasta, potatoes, pizza, bread, buns, you name it. I've tried the low carb healthy versions. Most are tolerable but just aren't the same. I guess I could really use this cookbook to prepare my low carb foods in a delicious way. I miss having a really good sandwich on some fresh baked bread or rolls. I have wanted to get this cookbook! I'm excited to read this cookbook!! This looks amazing! Can't wait to make this! I miss macaroni and cheese and fettuccine the most. I have missed Chinese (asian) food the most. Mental clarity so much better on a low carb diet. I don't really miss anything. I used to love noodles and ramen soups, pasta..but I find now that I am not missing any of that at all. It's odd, but a good thing. =) No cravings for those kinds of carbs. Now I just crave peanuts and cheese. I missed potatoes. 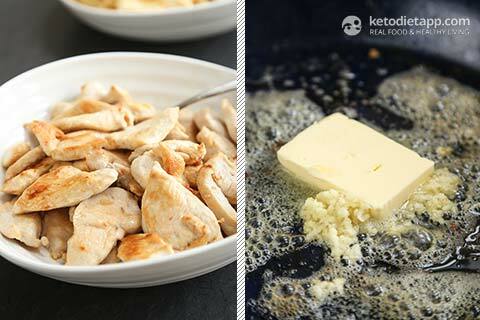 I use to make hash browns or french fries, mashed potatoes several times a week before finding Keto. That is the one thing that I really have not found a suitable replace for. Yes I have tried cali mash. Yuck doesn't begin to compare. 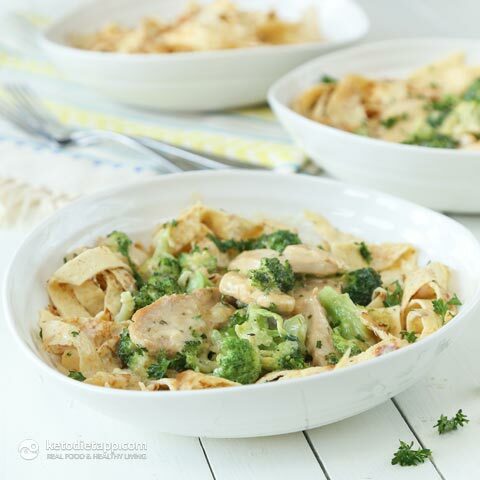 I would love to win this cookbook, and the recipe for Fettuccine Alfredo with Chicken & Broccoli looks fantastic! I think I will be making that this weekend. Thanks for sharing and the contest! I miss the bread that one can get in France. Otherwise I think we can find a substitute for almost everything else. I love that we can still enjoy delicious food without feeling deprived. Thank you for all you do. Wow. This recipe looks amazing. It is on my menu this weekend for sure. I love ricotta so I am looking forward to this. not having to think about every single ingredient, even in healthy foods, like fruit! In summer, I miss fruit - I used to devour tons of fruit (watermelons, melons, peaches, nectarines, mangos, cherries...) And in colder time, I miss potatoes - not fries though, but like in Spanish tortilla, mashed potatoes. I think I most miss garlic toast, especially in light of this absolutely delicious looking and sounding recipe. Looks like a beautiful cookbook. Thanks for your review and sharing the recipe. To be honest I don't miss old diet because of my health issues. But, when thinking about stuff I ate it would be bread with lots of chocolate spread. I miss sweets and chip, but it's not that bad! I don't miss anything but since it's summer, I want fresh summer corn from the farms. Can't wait to try. I never thought of crepes for pasta. Recipe looks fabulous. I am going to try it tonight!!! This book looks amazing! Just starting my low carb life style and these recipes look awesome! The convenience - I find it really hard to buy suitable snack foods if I'm peckish and on the go! I don't miss anything since I started eating low-carb. I feel more satisfied and my blood sugars have been much easier to control since I have T1D. I do have to take a few more supplements but, overall, I feel better than before. BREAD, hot and fresh from the oven! The convenience of eating on the fly. I find it really hard to buy suitable snack foods when I'm out and about and feeling peckish! I miss Chumichangas, corn chips, and tortillas! First comment ever! I am really digging this website/blog and slowly introducing this WOE into my life - I'm pretty good regularly but it's the prep I'm miserable at so far - baby steps - it's getting easier!!! I do miss my Montreal bagel though ;) Low Carb Cookbooks and Blogs are my new BEST friends!!!! When I cook like this, everything is always better! No brain fog, increased energy, and just feel better! And these recipes are amazing!! I can honestly say, at this time I do not miss or want for any foods. I am satisfied with what I have. I never realized it until you asked the question. So, thank you. I love the crepes idea! How do they store? Can you freeze them or refrigerate them for a few days? I really don't miss much, because there seems to be a workaround for almost anything. And the food we eat on this way of living is so satisfying! I think good ol French fries though - that I miss most, IF I'm ever craving anything. I am so wanting this book. It's on my wishlist. Honestly not much. I can adapt anything and know how to order when I go out. Thanks for your review! I've heard of this book, but your review helps a lot. OMG the crepe noodles are brilliant! french fries... but i recently found a recipe for parsnip fries that i'm dying to try! Really miss potatoes..sweet potatoes, mashed, potato salad...and once in a while still miss my toast and oatmeal. Just started keto a couple of months ago and could really use some recipe ideas....especially for breakfast. I miss cokes. And corn on the cob. But not much. I feel so much better. Strangely, I miss bagels. I rarely ate them in the past, but it's just one of those things that I smell toasting at the office, and it makes me want one! I miss the sweet stuff (especially ice cream) but I don't miss the migraines I used to get or the crazy cravings! I miss potatoes and frozen custard. Pizza and French Fries would be the 2 things I miss most. I have found close alternatives for pizza however french fries definitely miss some times. However feel a million times better without the carbs and love my new life! Looks great. One to try for sure! Since eating low carb, I mostly miss quick convenient foods. Can't just slap together a sandwich when you've had a crazy day at work and are HANGRY when you get home. Have to plan ahead a little bit more. I would give anything for a big, juicy, piece of Watermelon. But while I know that I could technically have it as long as I stay in my macros...I'm too new to keto to try that out. Instead, I'm sticking to this and working on being healthier...one day at a time! I miss root vegetables the most since starting keto. I miss potatoes the most. Everyday that goes by I get better at missing them less. I have missed pasta, but seeing a recipe like this is incredibly inspiring. I already have the Keto Diet Cookbook which is amazing and so incredibly easy to read and follow and has been an incredible source of inspiration in beginning my keto transformation. Books like these help me get my family involved without them feeling like they are on my diet but joining my journey. I miss bread but I don't miss how it made me feel! Surprisingly, I don't really miss much. 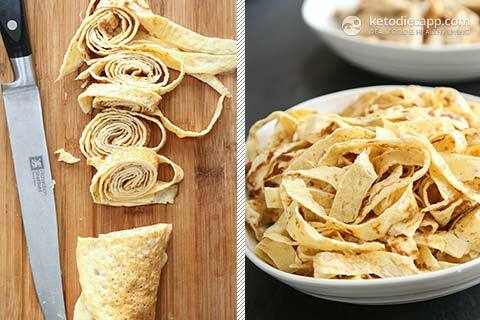 I would like to find a substitute for tortilla chips (without using flax seed - makes me sick). But I have adjusted to this way of eating; helps that I don't have foid around me that I can't eat. Wow, that is one huge recipe book! 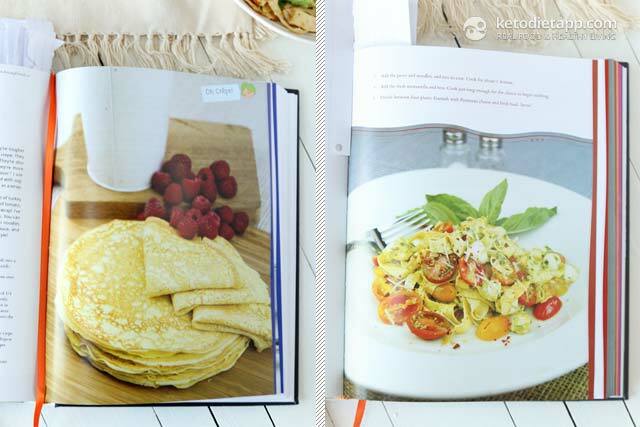 The crepes look soooo yummy and very versatile! I love the idea to use them for enchiladas (I really miss these). Thank you for sharing DJ's recipe. I would love to win his book! So excited for this!! It looks AMAZING. Taters! I love(d) potatoes. Mashed, baked, fried, you name it. What is worse, pasta or white potatoes? I ask this because I pretty much have given up pasta since I have started eating Keto or low carb. I do miss it, but I miss gnocchi more! I found a frozen gnocci that is made with potatoes and almond flour...they are pretty tasty, but because of the potato, I only allow when I am dong a carb up. I had a re-feed yesterday due to sweets...need to make something that I can treat like a candy bar that isn't 44+ carbs! I really miss the bloated feeling of fullness after a meal... Oh wait, no, that's not it. There is nothing particular that I miss, although I used to find the on-the-go meals a hassle when I was travelling as in the UK, the only options seem to be sandwiches or salads that include pasta, potatoes or grains... Saying that, in the last year or so, it seems to be getting better as I'm better at planning as well as there being more low carb 'snacks' available. Sometimes I miss fancy, shmancy bread things. But then I remember how they make me feel and it passes! I kind of miss having pasta. Sometimes the fake noodles do it for me, but not always. I'm looking forward to winning this book. Martinka, I love your website, love your recipes! I miss potatoes! All sorts of them, but I don't miss the inches. mine is ordered and can't wait to get it this month! I have already received your cookbook as well and I have ordered the fat bombs one too! My family is very excited about all the changes I am making and the new cooking skills they are learning! This looks so tasty! I bet the crepes are great for lasagna too. I don't miss mug but if I were to have a cheat meal it would be fresh cut fries! I need to increase the nutrients in my meals and get rid of aome weight. I enjoy cooking, and this cooking book looks like it could provide the guidance i have been looking for!! I miss bread and donuts. Yummy I must make this Fettuccine Alfredo, looks delish. I can hardly wait to get my hands on this book! It's always a nrw motivation to try new recipes! I miss cookies. All kinds of cookies. I really miss my rye bread! I don't miss anything about carbs. I've been keto for almost 4 months and I'm down almost 80 lbs. with the help of your Fat Bomb book. Thanks for all the great recipes. Tjis book looks like heaven! Can't wait to try some recipes and convert the rest of my family! Yum! I miss pancakes and waffles. I just can't do almond flour pancakes. Movie popcorn. Toasted pepitas with olive oil and lots of salt are not bad, but also not the same. I don't miss carbs with the amount of fat that I can now eat! Give me cheese and butter all day! Since starting with the recent Keto challenge I would have to say I miss the bread and pasta! So I'm excited to try this recipe out! Bread. and I'm going to make this tomorrow, just need to get some Ricotta cheese, have everything else. I definitely miss bread the most. A close second is chick-fil-a. I miss crispy bread the most! I think I miss bread the most. All things doughy are my downfall. I miss eating sourdough bread since I started eating low carb. This Alfredo looks delicious! I love pasta soooo much, but I really want to stick with keto long term (aka forever) and I just can't let myself induldge, not to mention being celiac... So having a book like this would be amazing! Thanks for the recipe! Totally awesome! The book looks amazing! Looks like a great book! Can't wait to read it. Looks delicious! Can't wait to make this. I also miss bread. Biscuits; ie biscuits and gravy! !